Tommy Rachel, Balloon Master of the festival and owner of Taking Off Hot Air Balloon Company in Magnolia Springs, Ala., wasn’t just full of hot air when he presented the concept to the South Baldwin Chamber’s Board of Directors. After much discussion and research, the Board approved the event and spent a year planning and organizing – with help from a group out of Louisiana well-versed in all facets of successful ballooning endeavors. They also needed local folks familiar with the area available to assist visiting pilots on the ground and with their balloons. To aid in the efforts, the City of Foley Police and Fire Departments and the Foley High School Band Boosters stepped in. Today, the summertime festival welcomes more than 50 hot air balloonists from across the country. You can view the “floating works of art” as they take to the skies by morning, or get a close encounter at nightly balloon glows. In between airborne and tethered displays, guests can take in free entertainment including live music, the Disc Connected K-9 World Famous Frisbee Dog Show, antique tractor displays and a Kid’s Fun Zone featuring face painting, inflatables, baby alligators and an interactive Hot Air Balloon Display. Did we mention the BBQ and homemade ice cream? Grab a cone or plate before you peruse and delight in the on-site demonstrations and unique artwork of local artisans and retailers. Just don’t expect to lift off in one of the colorful balloons. Because of overwhelming demand, regular rides are not possible during the festival. But there are a limited number of tethered rides available for purchase. Before or after the festival, Taking Off Hot Air Balloon Company can make your ballooning dreams come true. The Chamber says it takes everyone pulling together to make it all come together, and the team is grateful to the volunteers, as well as the businesses that sponsor the event – including presenting sponsor Tanger Outlets. Of course, because it is such a weather dependent activity, balloons can only fly within two hours of sunrise and sunset. For up-to-the-minute weather information, tune in to WHEP 1310 AM or 92.5 FM or find the Gulf Coast Hot Air Balloon Festival on Facebook. The best time of day to watch the balloons in flight is early morning, around 6 a.m. During the day when the winds pick up, there’s still plenty to keep your family’s attention. 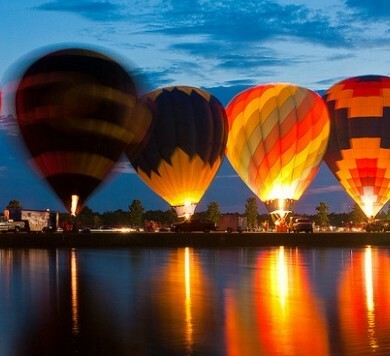 The glowing balloons at dusk will round out your day in spectacular fanfare.